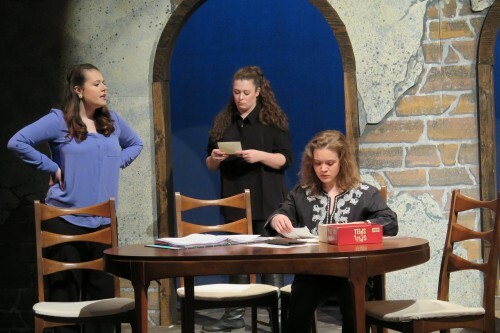 The Seton Hill University Theatre and Dance Program will present “Letters to Sala,” by Arlene Hutton, April 6 to 14 in the William Granger Ryan Theatre, Performing Arts Center, 100 Harrison Avenue, Greensburg, Pa. Tickets are $16, with student and group rates available. A reception with the cast and crew follows the opening night performance on April 6. Playwright Arlene Hutton will visit Seton Hill on April 12 and participate in a talkback with the director and cast following the matinee and evening performances that day. Her visit is supported by the Eva Fleischner, Ph.D. Endowed Fund of the National Catholic Center for Holocaust Education. Call the Seton Hill Performing Arts Center Box Office for tickets at 724-552-2929 or purchase tickets online. Performances: April 6, 12, 13, and 14: 8 p.m.; April 8 : 2 p.m.; April 12: 10:30 a.m. 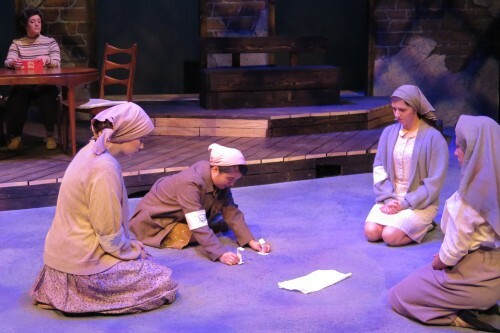 This is the story of Sala Garncarz, who, as a 16-year-old in 1941 Poland, volunteers to take her sister’s place at a labor camp, which begins an odyssey that will take her to seven Nazi labor camps during the course of World War II. Every letter she receives from home is saved, hidden and transported to the next destination - over 300 letters in five years. In 2005, when an elderly Sala reveals her collection to her daughter, a struggle ensues among three generations of women. Should the letters be kept as personal family history or donated as historical documentation of the Holocaust? Based on Ann Kirschner’s book “Sala’s Gift.” Sala Garncarz died on March 7, 2018. We are honored to present this play in her memory. 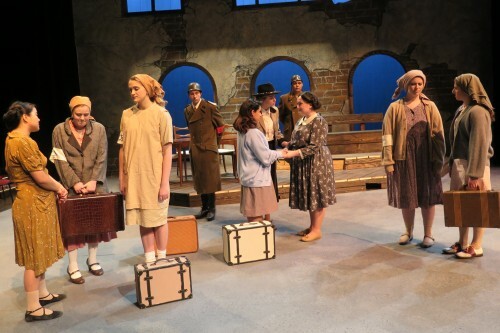 The Seton Hill student cast of “Letters to Sala” includes Elena Bravo of Pittsburgh, Pa.; Bridget Forsythe of Pittsburgh, Pa.; Hannah Kirschner of North East, Pa.; Maddie Kocur of Oakmont, Pa.; Barbara Lawson of Manassan, Va.; Gwendolyn Little of Mechanicsburg, Pa.; Layne Lueckert of Donegal, Pa.; Colleen Malley of Trafford; Angela Mazzocco of Imperial, Pa.; Travis Miller of Greensburg, Pa.; Cameron Nickel of Bethel Park, Pa.; Johanna Nimmer of Libertyville, Ill.; Leah Prestogeorge of Pittsburgh, Pa.; Taylor Puc of North Huntingdon, Pa.; Lillian Real of Pittsburgh, Pa.; Hannah Taylor of Wexford, Pa.; Noah Telford of Greensburg, Pa.; and Frankie Weber of Elizabeth, Pa. The Seton Hill student technical staff includes Katie Adler of Springdale, Pa., scenic paint and props crew; Ashley Blazczak of Saxonburg, Pa., costume shop crew; Brooke Caldwell of Cambridge Springs, Pa., scenic paint and props crew; Kailey Campbell of Annapolis, Md., scenic paint and props crew; Molly Carbone of Allentown, Pa., scene shop crew; Sarah Como of South Park, Pa., scene shop crew; Ian Denham of Bunola, Pa., assistant master carpenter; Brittany Dilliot of Arnold, Pa., costume shop crew; Angela Emanuele of Greensburg, Pa., costume shop crew; Stacey Fils of Boardman, Ohio, staff electrician; Jordan Gilbert of West Newton, Pa., scene shop crew; Lauren Grasser of Johnstown, Pa., costume shop crew; Amelia Heastings of Bethel Park Pa., stage manager; Liam Johnston of New Kensington, Pa., scene shop crew; Maureen Kailhofer of Shorewood, Wisc., scene shop crew; Jessica Lami of Farmington, Conn., assistant lighting designer and scene shop crew; Julie Lang of Pittsburgh, Pa., costume shop crew; Gwen Little of Mechanicsburg, Pa., costume shop crew; Rebekah Kephart of New Kensington, Pa., costume shop crew; Jessie Malone of Ruffsdale, Pa., scenic paint and props crew; Tasha Matthews of Springdale, Pa., sound board operator; Jordan Mayers of New Park, Pa., scenic paint and props crew; Kaitlyn Mayers of New Park, Pa., scene shop crew; Anna McClain of Belle Vernon, Pa., scene shop crew; Victoria Michaels of Pittsburgh, Pa., wardrobe manager; Beth Miller of Pittsburgh, Pa., costume shop crew; Elaine Montgomery of Trafford, Pa., scene shop crew; Breanna O’Brien of North Huntingdon, Pa., assistant stage manager and scene shop crew; Halle Polechko of Harrison City, Pa., assistant to the wardrobe manager and costume shop crew; Lilian Real of Pittsburgh Pa., costume shop crew; Brendan Reed of Drums, Pa., master electrician & staff electrician;Lyn Starr of Pittsburgh, Pa., staff electrician; Anna Strauser of Uniontown, Pa., dresser; Ashlynn Swauger of West Newton, Pa., light board operator; Riley Tate of Munhall, Pa., scenic paint and props crew; Justin Taylor of Bronx, N.Y., scene shop crew; Noah Telford of Greensburg, Pa., assistant stage manager and scene shop crew; Robert Tramontina of South Park, Pa., staff electrician; Jordyn Turner of Bethel Park, Pa., costume shop crew and dresser; Trenae Waller of Laurel, Md., set design; and Jacob Westwood of Irwin, Pa., costume shop crew and scene shop crew. 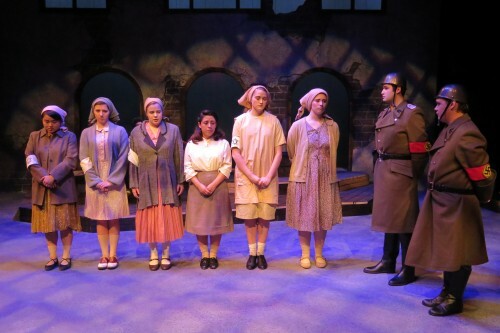 The Seton Hill University production of “Letters to Sala” is directed by Kellee Van Aken, Department Chair of Theatre and Dance at Seton Hill University. Her Seton Hill directing credits include, Good Person of Setzuan, A Midsummer Night’s Dream, A Little Night Music, Urinetown, Salvation Road, Running in Traffic by Denise Pullen (world premiere), Cabaret, Macbeth, Kindertransport, and Life is a Dream. Other directing credits include, Mercy Train (Microscopic Opera), Rachel Carson Saves the Day! (Shakespeare in the Schools), Tammy Ryan’s Lost Boy Found at Whole Foods (reading), Phantasmagorilla (premiere) Opera Theater Pittsburgh, The Pirate Queen, Timeout with Didi and Rose!, autodelete (readings City Theatre Momentum). With visual artist and puppet maker Cheryl Capezzuti she has created and directed over half a dozen performances including Random Teleology, Songs from a Lost Civilization (Lovelace Puppet Festival), Mismatched Pair (Philadelphia Fringe Festival, Women’s Work Festival, Penn State Arts Festival, Black Sheep Puppet Festival), the musical Colorfast, with composer Douglas Levine, Night Flight, and Stuff (all for Pittsburgh International Children’s Theatre Festival.) She worked for eight years as City Theatre’s Artistic Associate under Marc Masterson and Tracy Brigden. 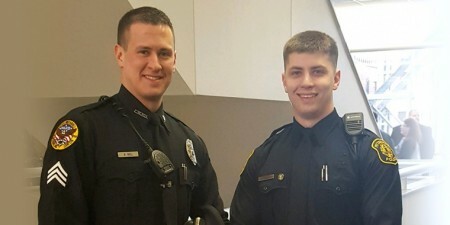 She also served as the Programming Supervisor at Gateway to the Arts. She has her Ph.D. in Theatre History and Performance Studies from the University of Pittsburgh. 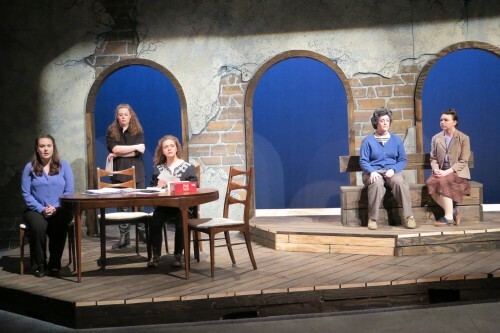 Professional artistic staff for the production includes Patricia Barker, costume shop manager; Ken Clothier, assistant professor of theatre, lighting design; Thomas K. Crowley, technical director; Alicia DiPaolo, house manager; Karen Glass, assistant professor of theatre, projection design, charge scenic artist and properties manager; Ryan McMasters, adjunct instructor of theatre, sound design; Susan O’Neill, instructor of theatre, costume director; Miriam Patterson, adjunct instructor of theatre, costume design; and Katya Shaffer, box office manager; and Terra Skirtich, adjunct instructor of theatre, costumer. Ticket Information: Single admission tickets are $16. Seton Hill students (with valid ID) can purchase tickets for $5. Non-Seton Hill students (with a valid school ID) can purchase advance tickets for $13. Students from any school can purchase rush tickets five minutes before curtain, subject to availability, for $5 (with valid school ID). Groups of six or more can purchase tickets at a rate of $11 each with a reservation and advance payment. Order tickets online at http://www.setonhill.edu/tickets by phone at 724-552-2929, or by mail at SHUPAC Theatre Box Office, Seton Hill University, 1 Seton Hill Drive, Greensburg, Pa. 15601-1599. Box Office Hours, by telephone: 11 a.m. – 6 p.m.,Monday through Friday. Extended hours on performance days: 11 a.m. – 8 p.m. Thursday-Saturday and 10 a.m. – 2 p.m. Sunday.